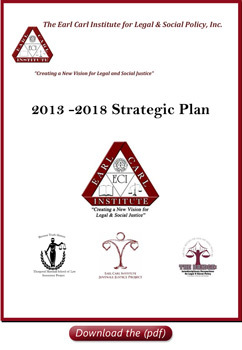 The Earl Carl Institute adopts the goals and objectives for the period 2013 through 2018 stated in this Section II of Part B. To better prepare students for full participationin the legal profession by substantially enhancing the student learning experience and by promoting socially responsible public service. Objective 1. Increase opportunities for advocacy through student research and writing about “real world” social and legal issues that advance the mission of the institute. Objective 2. Provide opportunities for student development to increase substantive knowledge, professional skills, ethics, and values for effective advocacy to the community served by Institute. Objective 3. Increase opportunities for students to participate in pro bono service by participating in clinical advocacy programs that provide access to justice and typically serve low-income clients. Institute Goal 1 supports the TMSL Strategic Goal 1: to substantially enhance the student learning experience and better prepare students for success in the profession. Institute Goal 1 also supports TSU Strategic Goal 3: to provide socially responsible public service. To expand the institute’s advocacy programs to provide professional quality services to benefit traditionally underserved communities. Objective 1. Increase resource development and funding from all available sources, including grants, public, and private donations. Objective 2. Improve, enhance, and develop programs that provide legal services to populations served by Institute. Objective 3. Increase the visibility of Institute through public relations and outreach. Objective 4. Increase clinical case handling capacity. Institute Goal 2 supports the TMSL Strategic Goal 1: to substantially enhance the student learning experience and better prepare students for success in the profession. Institute Goal 2 also supports TSU Strategic Goal 3: to provide socially responsible public service. To provide education to the university and to the community at large about legal and social issues having a disproportionate impact on minority communities. Objective 1. Increase the number of pertinent research projects resulting in educational materials, policy and position papers, and symposia and continuing education programs. Objective 2. Increase collaborations on projects with other colleges and organizations at TSU and with other institutions of higher learning. To promote interdisciplinary collaborations to address urban legal and social policy issues affecting urban communities. Objective 1. Increase collaborations on projects with other colleges and organizations at TSU and other institutions of higher learning, as well as with community organizations, government officials, and agencies. Institute Goal 4 supports TMSL Strategic Goal 2 which, in pertinent part, is: to promote scholarly productivity through its “support of its institutes and centers which serve not only to influence law and public policy, but also to enhance the Law School’s reputation.” Institute Goal 4 also supports TSU Strategic Goal 2: to provide basic and applied research by promoting interdisciplinary research groups and TSU Goal 3: to provide socially responsible public service. To ensure the institute plays an active role in the legislative decision making process. Objective 1. Increase opportunities to work on policy initiatives with members of the legislature, public officials, and community leaders by publishing relevant research- based educational materials and by advocating face-to-face in personal meetings. Objective 2. Increase participation in legislative matters. Objective 3. Increase collaborations on projects that affect the legislative process with other organizations, with public official, and with agencies. Objective 4. Expand outreach efforts to constituents and other stakeholders. Institute Goal 5 supports TMSL Strategic Goal 2 which, in pertinent part, is: to promote scholarly productivity through its support of its institutes and centers which serve not only to influence law and public policy, but also to enhance the Law School’s reputation. Institute Goal 5 also supports TSU Strategic Goal 2: to provide basic and applied research by increasing the number and quality of scholarly and creative works generated by the faculty and by students.